Today, the State Herbarium of South Australia published three articles in the online version of Vol. 30 of Swainsona and two other papers in Vol. 31. Vol. 30 of Swainsona is the first volume of our journal under its new name. It is a special issue containing the Proceedings of the Botany Symposium at the 2016 NRM Science Conference., celebrating the 60th anniversary of the State Herbarium. More information on the conference and videos of the presentations can be found online. To co-incide with this year’s NRM Science Conference, the State Herbarium publishes the first three article of the Proceedings of the Botany Symposium, which was entitled Botany 2016 — Past, present and future. (1) H.B. Cross, E. Biffin & M. Waycott, The Sturt pea through 300 years of Australian botanical exploration (1.3mb PDF). The introductory paper to the special volume examines the history of research on South Australia’s floral emblem, the Sturt pea, from the species’ first description to the latest Next Generation Sequencing techniques. Hill and co-authors review the fossil evidence for plant life in South Australia though time, in the context of latest research and discoveries, noting the role that fire may have played in the development of the Australian flora. The author reports on his long-term study of the lichens of Kangaroo Island, outlines the major vegetation types that lichens occur in and their threats, like clearing and fragmentation of habitat. He also discusses two remarkable lichens occurring on the island. Micarea kartana, a new lichen species from Kangaroo Island. Photo: J. Jarman. For many years, the type collection of Sturt pea was thought to be lost. George reports the rediscovery of the specimen and corrects the collection locality of the type, the specimen that was used to describe the species. 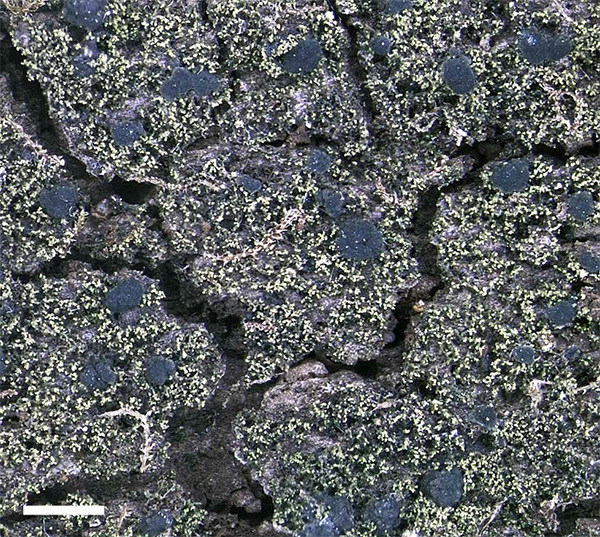 Continuing his research on Kangaroo Island lichens, Kantvilas describes a new species from moist log of rotting eucalypt in dry sclerophyll forest. This entry was posted in Publications on 11 April, 2018 by Jürgen.